What is the Best Dog Food for Shedding and Dry Skin? Your dog may shed a little throughout the year, but excessive shedding can be a clue that something else is going on with your dog. This excessive shedding can be covering a skin problem or irritation, and your dog's diet may have a lot to do with it. 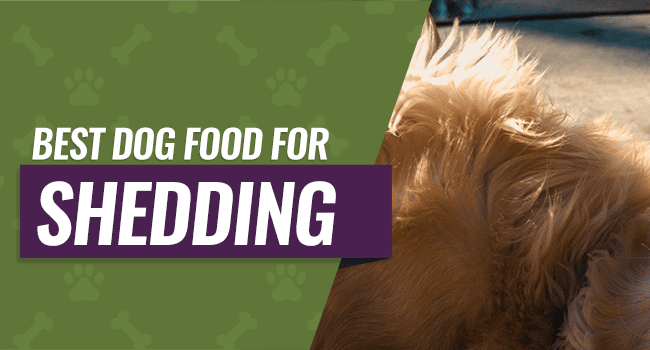 Changing your dog's food can be difficult, especially if you don't know what the best dog food for shedding is or what to look for when you shop. We've put together a buyer's guide along with several product reviews so you'll be able to pick out your dog's food with confidence and get any excessive shedding under control. Some breed of dogs naturally shed more than other breeds, but you should notice a marked amount of shedding going on that is out of the ordinary. You might even notice a big increase of dog hair while cleaning. 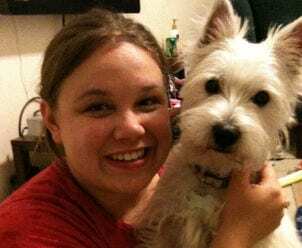 You want to look for brittle or dry hair, bald patches, tenderness to the area where your dog is losing the most hair, and clumps of hair falling out. Did you know that dog can develop food allergies just like humans can? 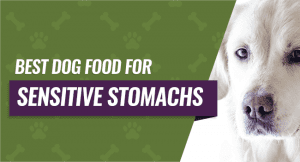 Eating particular foods that their digestive system can't process well can lead to common issues like bloat, diarrhea, itching, poor coat condition, upset stomach, and more. Your dog can develop allergies to chicken, beef, pork, corn rice, dairy, grains, soy, and fish. These allergic reactions can manifest in the form of excessive shedding because your dog's skin can dry out or become inflamed. A common issue for dogs is to develop dry and itchy skin or hot spots. If this happens, your dog can dig the area, and this can cause excessive shedding as they try to get to their skin to relieve the itching or burning sensation. Another possibility is that your dog has developed mites, mange, or other parasites that can cause them to itch and scratch at their skin. If you don't treat these parasites, it can lead to infection, anemia, or other more severe problems. A poor diet of cheap dog food may allow your pet to meet the bare minimum nutritional requirements they need, but it can also cause them not to get enough nutrients or protein to support their skin and coat health. 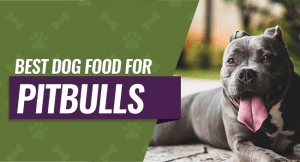 Ideally, you want to give your dog a rounded dog food that has more than enough nutrients they need to keep them healthy. This doesn't necessarily mean spending a lot of money per pound for your dog's food either. You can buy protein-rich dog food that is packed full of vitamins, minerals, and nutrients for a relatively low cost. When there is a lot of stress at home, your dog can feel it just like anyone else around them can. If you've recently relocated, changed your dog's normal routine, or welcomed a new child or pet into the home, this can cause their stress levels to skyrocket. In addition to your dog feeling more anxious, they can start to excessively shed in response to the heightened stress levels. You can try to eliminate the stress point if it's possible, or your veterinarian may suggest medications to help. A lot of dogs have hormone imbalances sooner or later during their lives, and it's more common in older dogs. If your dog has a thyroid imbalance, it can cause your dog's shiny and healthy coat to try dry and brittle, and it can fall out at an alarming rate. Other common hormone imbalances include low testosterone, progesterone, or estrogen. Additionally, having too much of these hormones can cause your dog to excessively shed their coats year round. 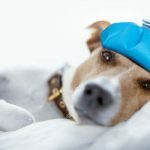 If your dog's symptoms get worse very fast, or if you notice that your dog isn't getting better with a diet change or lifestyle change, you may want to take them to see the vet. Other common indicators that it's time to see the vet include open sores, inflamed skin, patchy hair loss, hot spots, constant foot licking, or hair that pulls out easily. Your vet may prescribe your dog antibiotics for these problems to make sure that your dog doesn't get an infection. They may also be able to give you a good dog food to feed your dog or advise you on the best course of action to keep your dog healthy. 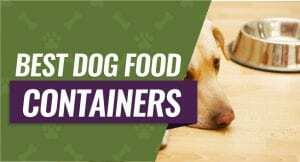 Although it may be tempting to grab a cheaper bag of dog food and be done, you want to ensure that your dog is getting everything they need to avoid having skin problems or excessive shedding. Your dog's food should have a high fat and protein count and a lower carbohydrate count. Fatty Acids - The fatty acid content in your dog's food helps to encourage healthy hair growth and healthy skin. You dog's body can't make these fatty acids naturally, so they need Omega-3 and Omega-6 fatty acids in their food. This can be accomplished by fish oil capsules. Minerals - It's important that your dog's food have a few if not all 12 essential minerals in the formula. It should have copper, calcium, choline, iron, iodine, magnesium, phosphorous, manganese, sodium, potassium, selenium, and zinc. Natural Ingredients - Your dog's food should contain natural ingredients instead of dyes and processed ones. You want to see meats, grains, and vegetables listed on the nutritional label. No Filler - Filler is the part of the dog food that has very little nutritional value for your dog, and it fills in the gaps in the beneficial nutrients. Ideally, your dog's food should contain no or very little fill or byproduct meal. Vitamins - Any dog food that you choose for your dog should have B vitamins in the formula. It should also have vitamin A, D, E, and K to support your dog's healthy skin and coat. If it doesn't you may be able to supplement with multivitamins. If you decide to switch your dog's diet, you want to do so gradually to avoid any digestive problems. You can start by substituting a quarter of a cup of the new dog food into your dog's current food. Over the course of the next week or so, gradually increase the new food while decreasing your dog's old food. 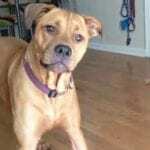 You want to make this transition as seamless and as easy as possible to reduce the chances that your dog will run into problems later on. This dry dog food comes in 14 different flavor combinations and four different sizes so you can quickly and easily customize your order to suit your dog's needs. Your dog will get deboned chicken as the main source of protein. 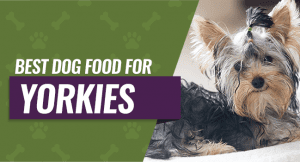 This food is packed full of dozens of essential vitamins, minerals, nutrients, vegetables, fruit, and wholesome meat products to support your dog's healthy skin and coat. This dog food is all natural, and it doesn't have any artificial preservatives, chemicals, or dyes, so it's healthier for your dog to eat. Pet parents who bought this dog food liked that it had an all natural formula with dozens of healthy ingredients and fatty acids. They didn't like that it can have a strong smell when you first open the package, and this dog food is slightly more expensive than other choices. This grain free dog food formula allows you to pick from four different size options and four different flavors ranging from salmon to turkey and duck. The first ingredient is the high-quality protein source, and it supports healthy skin, a shinier coat, and less shedding. 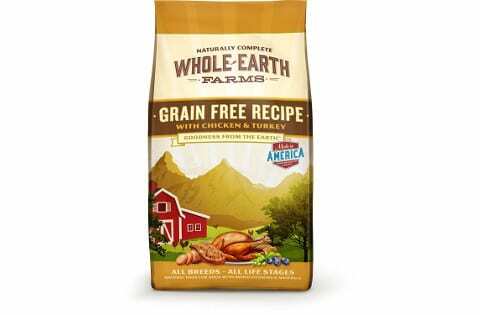 All of the ingredients are sourced from the United States, and the grain free recipe makes it easier for your dog to digest it each time they eat it. The formula contains no by-products, soy, wheat, dyes, or artificial flavors, so it's healthier for your dog as a whole. Pet parents who purchased this dog food really liked that they could pick and choose which flavor suited their dog the best, and they liked that there are no artificial ingredients in the formula. They didn't like that the quality didn't seem to be consistent with various orders for the same food. This dog food is specially formulated for dogs with sensitive stomachs, skin issues, and coat problems. You get the choice of six different protein combinations as well as four different sizes ranging from just over four pounds up to 26 pounds. 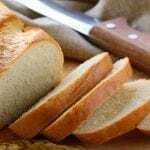 This food is made in the United States, and it has no artificial dyes, fillers, wheat, gluten, or additives, so it's gentle on your dog's digestive system. It has a higher protein count along with Omega-3 and Omega-6 fatty acids to help promote your dog's skin and coat health. 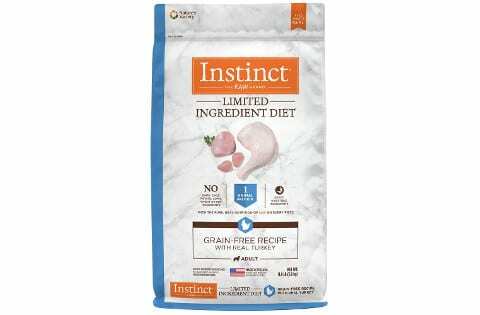 Pet parents who bought this dog food liked that it was made in the United States using only high-quality ingredients and no artificial fillers or dyes. They didn't like that the kibble seemed to be too hard for their dogs to chew properly or that the food came with a strong smell. AvoDerm's dog food is made with natural ingredients including California grown avocado and high-quality protein sources. The meat-based protein content helps to restore your dog's coat to a healthy and shiny state along with calming any irritation, itching, or inflammation. This dog food is also packed full of antioxidants, crude fiber, vitamins, and minerals to help support your dog's health from the inside out. It has no artificial preservatives, flavoring, wheat, corn, or soy for a healthier dog food you can feed to your dog every day. People who purchased this food for their dogs loved that it contained a high level of antioxidants, fiber, minerals, and vitamins to support their dog's internal and external health. They didn't like that this dog food only comes in two different flavors and that the kibble is on the more firm side. This dog food is designed to have a very simple and effective formula with one major animal protein source and one vegetable source. It comes with five different flavor combinations and four different bag sizes. This food supports and healthy skin and coat, and it doesn't contain any soy, wheat, dairy, chicken, beef, fish, potatoes, sweet potatoes, corn, chickpeas, dyes, or artificial flavoring. It's also made in the United States with high-quality ingredients, and it is held to strict quality standards. People who bought this food liked that they knew exactly what was going into their dog's diet because the ingredient list is so simple and easy to understand. They didn't like that some parts of the formula recently changed and it seemed to be harder for certain dogs to eat and digest. 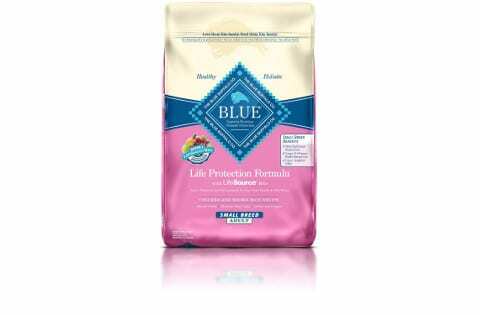 Our top pick for the best dog food for shedding is Blue Buffalo BLUE Life Protection Formula Adult Dry Dog Food. It comes in over 10 different flavor combinations and a variety of different size choices. The formula is also packed full of vitamins minerals, Omega-3 fatty acids, Omega-6 fatty acids, protein, and high-quality ingredients. It's designed to support a healthy skin and coat and help to control excessive shedding with your dog.